In addition to making soaps I also create chainmaille jewelry. By opening & closing each ring I create a variety of chainmaille patterns/weaves formed into a bracelet,necklace,anklets,earrings…. Chainmaille or mail is a material which was used historically to create protective garments for soldiers. It consists of small metal rings linked together to create a sturdy, but flexible mesh. In jewelry it creates a very sturdy piece that will last a lifetime. 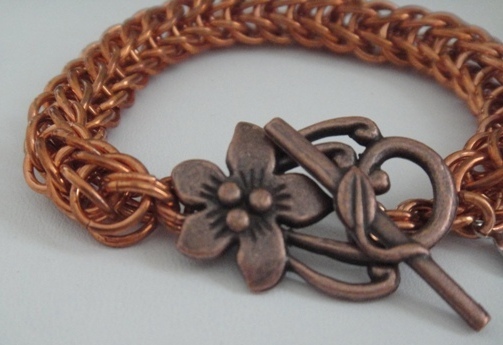 This entry was posted in Jewelry and tagged bracelet, bracelets, chainmail, chainmaille, chainmale, copper jewelry, custom made jewelry, fashion, full persian, jewelry, one of a kind jewelry, pure copper, stainless steel jewelry.